After check-in and a short lunch at the hotel's buffet restaurant, the expats took a bus to SND Cultural and Sports Center, where exhibitions themed around embroidery were attracting throngs of visitors and the embroidery art festival was about to begin its opening ceremony. The group enjoyed taking selfies in front of an event publicity board while holding a banner with "Go Jiangsu" painted on it, as well as various small animated cards depicting cultural elements of Jiangsu province, while the amateur live streaming host, J.D. Holtrop, apparently had the most fun. "I flew here from Qingdao, Shandong province", said J.D., "I'm glad to meet so many new friends here." J.D. 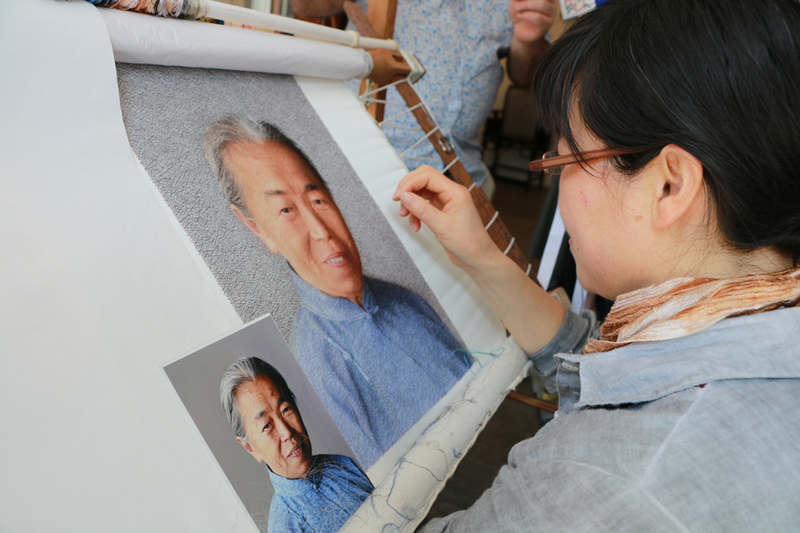 was also invited to do some live streaming while exploring the craftsmanship of traditional Su embroidery with his Chinese partner Ann Pan in Zhenhu Town, less than 5 km from the exhibition venue. The opening ceremony in the afternoon saw plenty of craftsmen receive awards for their outstanding pieces of work displayed on the screen, and Peter, the oldest but most mentally active among the foreigners, received the honor of being invited to speak on stage about the trip from the perspective of a foreigner living in China.